Nuclear strategy and deterrence in South Asia will play by its own rules. As obvious as this statement is, the problem is that most of the literature on the nuclear strategies and postures of regional nuclear powers is seen through the lens of the Cold War. This hangover imposes the experiences of the United States and the former Soviet Union on smaller nuclear weapons states and fails to acknowledge that the calculations and choices of India and Pakistan are fundamentally distinct. Because of the assumption that the strategic rivalry between India and Pakistan will largely mirror that of the superpowers, it is unsurprising that the strategic changes taking place on the subcontinent are overlooked. What, exactly, is changing? Based on fieldwork, I argue that small but significant shifts in Indian and Pakistani strategic thinking point to the viability of a limited conventional war under a nuclear threshold. The interviews reaffirmed that this trend had gained traction in some sections of the strategic communities in New Delhi and Islamabad, increasing the likelihood of a short, sharp, but limited conflict. The potential ramifications of a war between the South Asian rivals mean that any such change in the strategic landscape should command serious attention. Recent developments suggest that there is scope for a limited conflict under the nuclear threshold. Speaking at a press conference in January 2018, Indian Army Chief Bipin Rawat stated that India would not be restrained from responding to Pakistani aggression and questioned Islamabad’s red lines for nuclear first use. Unsurprisingly, a Pakistani military spokesperson invited New Delhi to test its resolve and cautioned Rawat against taking any military action. While the rhetoric between them follows an old playbook, the status quo on the subcontinent is not impermeable to change. What has held India back from initiating a limited conflict? The architect of Pakistan’s rationale for introducing short-range tactical nuclear weapons (TNWs), General Khalid Kidwai of Pakistan’s Strategic Plans Division, reasoned that TNWs would remove India’s ability to wage limited war. This need, he said, was urgently felt across Pakistan’s military establishment due to India’s growing conventional military superiority and its drive to modernize its military hardware. Yet it seems that Pakistan’s moves to permanently close the space for limited war have instead energized and prompted significant changes in India’s conventional military doctrine. In 2004, the Indian Army concluded that its defensively oriented doctrine, which it had maintained since 1947, was no longer suitable to respond to Pakistani threats at the conventional and subconventional levels. 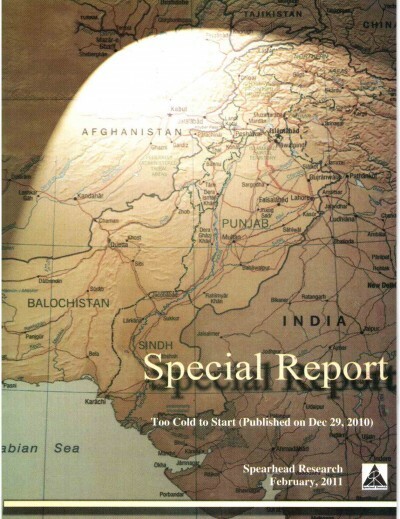 Although not formally in print, in April 2004 the Indian Army adopted a doctrine known as “Proactive Military Operations” or “Cold Start,” which it has been implementing ever since. This doctrine envisions rapid mobilization of integrated battle groups (IBGs) to enable a series of surprise but shallow offensives into Pakistan. Such offensives would seek to achieve limited objectives without triggering a nuclear response and occur before international pressure could come into play to halt India’s military operations. Certain changes on the Indian side underscore small but notable shifts that have been taking place over the past few years and are designed to circumvent Pakistan’s lowering of the nuclear threshold via TNWs. New Delhi believes that the Pakistani military establishment has continued to calculate that it can sponsor terrorists to target India without the fear of reprisal attacks due to the belief that its first strike nuclear posture prevents India from taking military action. For Indian strategists, the lack of an Indian military response following the assaults in Mumbai in 2008 and Pathankot in January 2016, among others, reinforced the notion that New Delhi prefers strategic restraint. This restraint arguably reached its shelf life on September 18, 2016, when Pakistani militants killed 19 Indian soldiers in the Indian state of Jammu and Kashmir. On September 29, 2016, at a rare joint press conference at the Ministry of External Affairs, the Indian director general of military operations briefed the media about an Indian Special Forces operation against militant camps across the Line of Control (LoC) in Pakistan-administered Kashmir. Although Pakistan denied India’s claim that such an attack occurred, an independent BBC investigation confirmed that a covert operation of some sort had taken place. More recently, the Indian government released video footage of this operation. India’s decision to retaliate challenges Pakistan’s view that its first-strike nuclear posture, together with its arsenal of short-range TNWs, compels India to eschew military action. Despite their limited deterrence value, India’s tactical strikes were packaged to convey the existence of a political will to respond to terrorist attacks traced back to the Pakistani state. Concurrently, the military action also helped to assuage public opinion that is increasingly demanding the political leadership in New Delhi punish Pakistan. But, as public opinion gets stronger, any government in New Delhi will have to grapple with the challenge of not being at odds with the electorate while balancing the efficacy of a proportionate response. For India, the dual requirements to counter Pakistani aggression and to convey to the public that New Delhi refuses to be hurt without a commensurate response are reasons why a window is being sought for the conduct of such offensive operations under the nuclear threshold. Whether this shift is likely to alter Pakistan’s behavior toward India is unknown, but it has the potential to change its cost-benefit calculus for better or for worse. These events demonstrate that the strategic dynamics on the subcontinent are not static and it would be perilous to assume otherwise. Proponents of India’s limited war doctrine discount Pakistan’s red lines for the use of its nuclear weapons. In interviews with advocates of this doctrine in New Delhi, including senior Indian military generals, intelligence officers, and diplomats, they argued that TNWs would not stop an Indian military response, despite Pakistan’s posturing. They disavowed claims by Pakistan that TNWs have changed the calculus and have improved its nuclear deterrence posture against India. Indian military specialists contended that the Pakistani military establishment might be adventuristic, but they are not suicidal, as any use of nuclear weapons by Pakistan would trigger massive retaliation from India. A former Indian Army general who commanded one of three strike corps argued that Pakistan intentionally makes a show of instability to advance its strategic agenda, to suggest that Islamabad’s threshold for nuclear use would be low enough to result in early nuclear use. The general warned that the responsibility for escalating a conflict to the nuclear level rests on Pakistan’s shoulders, given India’s no-first-use nuclear doctrine, and he cautioned that if it chose to escalate, India would respond as per its doctrine of assured massive retaliation. Indian political and military leaders also stressed that the country possesses the military capability to execute proactive military operations, even though India’s Army, Air Force and Navy have well-known capability deficiencies. Another argument advanced by those who want to call Pakistan’s nuclear bluff argue that geography calls into question Pakistan’s rationale for the employment of TNWs. A former Indian general that commanded a corps in Jammu and Kashmir gave credit to the Pakistani Army’s capability to mobilize more quickly than India’s after the forward deployment of many of its formations that leave a forward zone of 4 to 8 km from the international border. But Pakistan’s ability to mobilize rapidly near the border with India comes at the cost of diminishing the space in which it could use TNWs. The general cautioned that Pakistan would have to contend with the situation of using TNWs on its own soil that could endanger its own forces or alternatively launch a strike against Indian IBGs that would still be within Indian territory. He maintained that despite Islamabad’s rhetoric on the early use of nuclear weapons, “Pakistan is not itching to employ the TNW trigger” because it knows India would exercise its doctrine of massive retaliation, and due to these constraints India could exercise flexibility as it deems. This flexibility has been war-gamed by the Indian IBGs, which the general said suggests that thrusts of around 25 km into Pakistani territory across the international border are open for exploitation without the threat of a Pakistani TNW strike. Furthermore, he claimed that such shallow thrusts would be viable as they do not threaten Pakistan’s national highway, a likely Pakistani redline. What these views indicate is that the doubting of Pakistan’s red lines within Indian political and military circles stems from a conviction that Pakistani decision-makers have deliberately manufactured instability to profit at the strategic level by inducing fear and policy deadlock in New Delhi. This means that Islamabad cannot discount an Indian military response if there is a gross provocation that New Delhi traces back to the Pakistani state. Surprisingly, some interviewees in the Pakistani military agreed that nuclear deterrence does not necessarily preclude the space for a limited conventional conflict. For instance, a former head of Pakistan’s Inter-Services Intelligence Directorate in Islamabad noted that a limited conventional conflict was a possibility under the nuclear threshold as the introduction of TNWs has generated a paradoxical effect. On the one hand, TNWs have increased pressure on Pakistan to convince India that it would use these weapons at an early stage of a limited conflict, but the Pakistani military has failed to persuade India that it has lowered its nuclear threshold. On the other hand, labels such as “tactical” for TNWs are irrelevant, as nuclear weapons are inherently strategic weapons irrespective of their yield. What this means is that any nuclear exchange, once initiated, would be strategic and trigger India’s nuclear doctrine of assured massive retaliation. Another Pakistani general in Islamabad had a similar view, noting that TNWs have failed to generate stability at the lower end of the nuclear threshold. He added that the inability of Pakistan’s TNWs to close the space for limited war had granted India an advantage to exploit for a limited conflict. The main advantage that exists for Pakistan, he quipped, was India’s haphazard military modernization program, which curbs New Delhi’s ability to prosecute a limited war. A prominent Pakistani strategic analyst who agreed to be interviewed on the condition of anonymity also rejected the popularly held view on TNWs in Pakistan. This analyst stated that “TNWs are hugely detrimental for Pakistan,” and questioned the logic of deploying these weapons, which could fall into Indian hands, arguing that even desperate local commanders would not use them for fear of self-destruction. The interviewee added that more than the Pakistan Army, it was more likely for an extremist group to use them based on their long history of martyrdom operations and suicide bombings. Such views demonstrate that Pakistan’s strategic community is not unanimous on whether its TNWs have permanently removed the prospect of a limited war under nuclear conditions. The notion that the space for limited war exists makes the prospect seem more attractive and workable for its advocates in New Delhi. Notwithstanding the limited nature of India’s covert strike in September 2016, it is significant for four reasons. First, it demonstrates that New Delhi is determined to change the rules of the game by overtly showing that it has the political will to take military action against Pakistan, despite the risk of escalation. Second, it indicates New Delhi’s intention no longer to tolerate the costs of terrorism without inflicting costs of its own on the perpetrators: in other words, it seeks to increase the cost for Pakistan to employ terrorism against India. This cost, however, could be inflicted covertly to force Pakistan to retract or dampen its actions against India. Third, it is intended to show observers on both sides of the border as well as the international community (particularly China, Pakistan’s primary political and military supporter) that Pakistan is vulnerable to Indian strikes. Fourth, it signals India’s readiness to absorb the costs of a potential Pakistani retaliatory strike, as well as its willingness to escalate hostilities if required. The political decision to attack militant camps in Pakistan does not mean that New Delhi has abandoned its decades-long policy of strategic restraint, but rather that it has shifted to an active policy of calibrated response, which opens the space for it to wage a limited conventional war. It is too early to say what impact a shift in India’s strategy will have on bilateral relations with Pakistan and how the latter intends to respond, but what can be said is that the old playbook is probably reaching its end. It is imperative to recognize these shifts given that despite the risk of escalation, India has demonstrated its willingness to use force and to publicize its action even though what it did was by no means strategic. Furthermore, New Delhi has signaled that it is progressively working toward developing and refining the means to devalue Pakistan’s nuclear deterrent posture and diminish its ability to serve as a firewall behind which it can sustain its strategic agenda. Even if the views reported above are minimally held on either side of the India-Pakistan border, which currently they probably are, the emergence of these perspectives indicate that the strategic environment is not moored to the past. Over time, such views have the capacity to alter the strategic dynamics between New Delhi and Islamabad significantly, which would have broader political, military and strategic implications. Dr. Nishank Motwani is a Visiting Fellow at the Asia-Pacific College of Diplomacy, The Australian National University, and Consulting Researcher for Armed Conflict at The International Institute for Strategic Studies (London). His research examines transnational conflicts, regional competition, nuclear strategy and security with a focus on South Asia.